An in-depth curriculum for experiencing the ecstasy hidden within your own voice. In India, the tradition of chant is revered as the highest form of devotion: a form of vocal meditation that is practiced by common people and sants (saint singers) who wander through every village and city of the subcontinent. Through prayer sung from the heart, it is understood, anyone can achieve profound spiritual transformation and ecstasy. With voice alone, they reach the divine and merge, drowning in the sea of God's love. 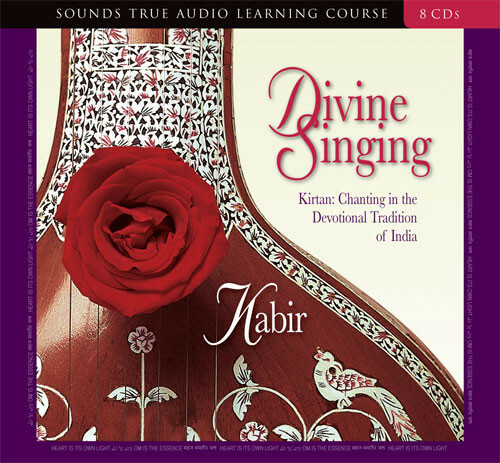 It is in this timeless tradition that Divine Singing is offered as an intensive training course in the devotional music of India. Drawing from 30 years of experience, Kabir teaches a simple, easy-to-follow system you can use to experience the love, longing, and ecstasy hidden within your own voice. Divine Singing is not about religious belief. Rather, it draws from the rich musical world of the Hindus, Sufis, Buddhists, and believers of other faiths to vividly demonstrate how the voice can serve as a direct bridge to the divine. In 11 step-by-step sessions, you will discover the joy of chanting as a spiritual practice, principles of tonal resonance in body and spirit, the sacred silence within sound, the beauty of raga melody, how to attune to the creative power in sound, 20 authentic chants and hymns of devotion for you to sing along with, and much more. Here, for the first time, is an innovative synthesis of music and spiritual practices, waiting to open Western seekers to the realm where chant is an exalted vehicle for cosmic consciousness, a realm where your own voice is the bringer of mysteries, a realm where your voice and divine sound are one, the realm of Divine Singing.